Pack the brown sugar in the bottom of a loaf pan, and spread the ketchup on top (I rarely measure it, just eye it and make sure to reach the corners too). Then, in a mixing bowl mix the beef, milk, eggs, chopped onion, bread crumbs and season with salt and pepper. Bake for 1 hour at 350ºF (175ºC). The most important requirement for this recipe is a loaf pan. If you use a wider pan, the sugar and ketchup will end up escaping from under the meat and the sauce won’t be as tasty. For the version I made this week, I only had 1lb of meet, so I reduced the rest of the ingredients. However, I forgot to do that for the milk, so the mix ended up being a bit too liquidy. To fix that, I added a bit more of bread crumbs. It’s not great, but as I said before, it ended up tasty great anyway. 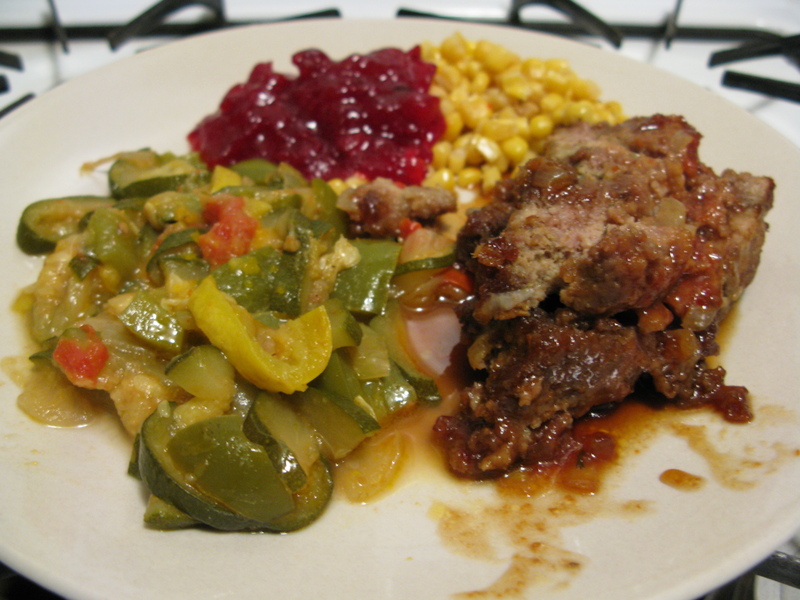 Here it is, plated with stewed vegetables, corn and cranberry sauce. The cranberry sauce actually ended up being too much with this because the meatloaf has a sweet taste to it already, so we skipped it for the following meals. Here are the recipes. Stewed vegetables – Melt 3 tbsp of butter in a pan and add one onion cut in large cubes. Cut up a mix of different squashes (here I used yellow squash and summer squash), one tomato and one green pepper. Add them to the softened onion, season with salt and pepper and add 2 tbsp of brown sugar. Stir and let cook, covered for 15 min followed by 10 minutes uncovered to evaporate some of the liquid. Cranberry sauce – Add 1 cup of water and 1 cup of sugar to a pan, let it come to a boil and the sugar completely dissolve. Add 4 cups of cranberries and have fun watching them burst (don’t stand too close or you run the risk of having it splash in your face…). When most of the cranberries had popped, I added 1 stick of cinnamon and the juice of one orange. Let it reduce for about 10 min, mixing often. Corn – Couldn’t be easier: just buy a can of kernel corn, put it in a pot with water and a pinch of salt, and let it warm up a little. Drain and serve.